Another in a series from our friends at Mighty Oregon. An interview with senior offensive guard, Nick Cody. “He’s not the most talented athlete out there. He’s not the biggest, the fastest, the strongest guy, but he knows what’s going on out there, and is able to put himself in a position to be effective. 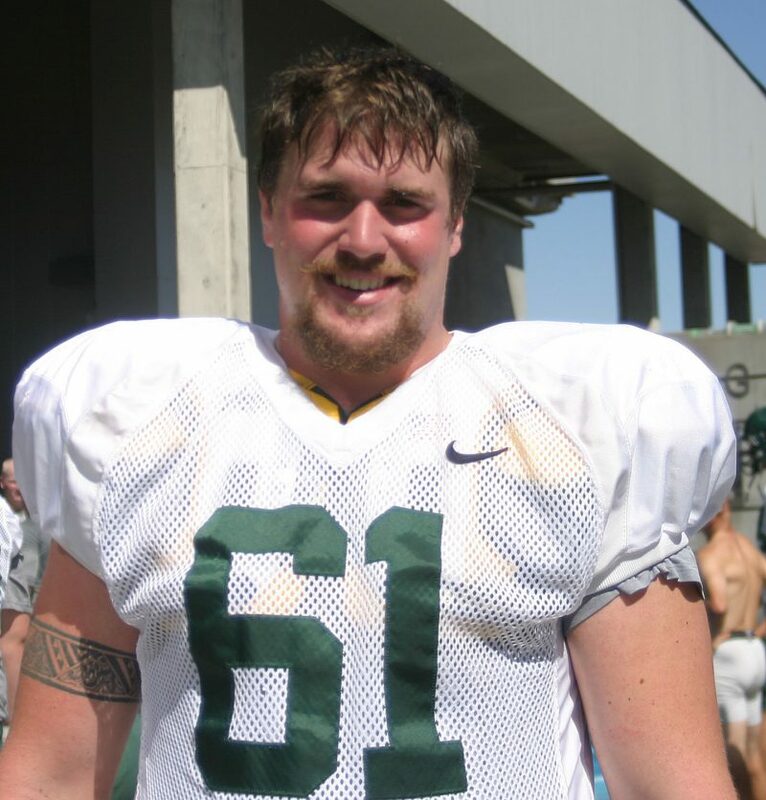 He’s a pretty self-motivated, driven guy.” That’s how Offensive line coach Steve Greatwood describes Oregon Senior Nick Cody. At 6’5”, 309 lbs., I imagine we’ll be seeing this Brush Prairie, Washington native playing on Sundays next season. Greatwood says intelligence and preparedness have been essential to the success of Nick Cody. “I really don’t know if I’ve had a player that prepares himself better for a football game.” Twice listed Honorable Mention by the PAC-12 for the All-Academic Team, it’s clear that this big guy has brains to go with the brawn. As Oregon’s most versatile offensive linemen, Cody played right tackle for the 2011 season, and for the 2012 campaign he moved inside to right guard. 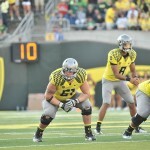 Oregon had question marks across the O-line for 2012, with Carson York coming back from knee surgery, and Tyler Johnstone and Kyle Long both getting hurt in the first game. A veteran like Nick Cody held it all together as the Ducks posted an 11-1 regular season record and are now heading into an exciting match up with Kansas State in the Fiesta Bowl. DI: Has your time as a Duck gone quickly for you? NC: Oh yeah, every year gets faster and faster. The season (seemed) to go by really quick. It’s kind of amazing when you get to this point. It’s hard to realize I’m a senior now. DI: So, you think the o-line has a lot of depth? NC: Right now we have two really strong groups, I think. I feel like we’re two deep at those o-line spots, and I’m really confident in all the guys next to me. DI: It took you a few years to get into the starting lineup. What was that like waiting your turn? NC: I got my opportunity against UCLA my very first year of playing down there when Nate Costa started. It didn’t work out exactly the way I wanted it to. I got hurt a little bit and banged up, and I wasn’t sure if I was ready for it mentally and physically, but it really taught me how much I needed to work and get reps in practice before I was ready to go out on the field and on game day to compete. I know coach Greatwood had a lot of confidence in my preparation and my understanding of the offense, but it just took me awhile to develop physically and develop the understanding and tendencies to just go out there and play relaxed, comfortable and confident. That’s the only way you can play in our system and be successful. DI: How tough is it to learn the system? NC: Oh man. It depends on what you’re talking about, but some things are simple, some things are complicated. Our defense certainly doesn’t make it any easier. I think in fall camp they give us about every single look we can get. So, that is tough. You have to adjust. It’s not so much that’s it’s complicated, but it’s just that the little tiny differences and nuances make a huge difference. If you step an inch in the wrong direction, that can get you completely off of where you’re trying to go and ruin everything for the offense. DI: Which position do you like the best? NC: I’ve played everywhere in the game except center, and I’m ready for that too, if that ever happened, but I like to keep myself prepared to do anything. I like to be versatile. I consider myself like a Swiss Army knife on the offensive line. I want to be able to fill in any position they need me to be in. DI: So, in which position are you most comfortable? NC: Any. I mean really, it’s not all that much different. Some of the terminology is a little bit different, but for the most part it’s the same thing: you’re coming off the ball and trying to hit somebody and put someone on the ground. I like that on any of our five spots on the offensive line. DI: You run up to the line quickly and get in your stance…what’s going through your mind…take us through what you’re looking at, what you’re thinking and what you’re listening for. DI: Can you always hear the play call? NC: We’ve got ways to communicate non-verbally, so it’s not an issue if we go someplace really loud. We’ve got ways to communicate without having to say anything to each other. DI: What’s the highlight of your career so far personally? NC: Oh man, I’d love to say all the BCS games, but that’s not really it. I think one of my huge goals coming in as a freshman was to be a part of a change in this program. My freshman class, we talked for hours about the kind of things we wanted to do, the goals we wanted to set, and the things we wanted to accomplish. We’ve done a lot of those things. I think just having the program elevated to where it is today is something I’m really proud of, and I’m always probably going to be most proud of that. DI: What’s the camaraderie like for the offensive linemen? NC: It’s always great. In our meeting rooms there’s always lots of laughs to be had, but then people watching films are dialed in ready to go. DI: After football, do you have any idea what you want to do? DI: Are you pretty happy with where you started here and how it’s developed? NC: You know, I have to be. I’m happy to be where I am today. You know, there are certainly some things I would have done differently to prepare myself maybe a bit earlier to play, but right now I couldn’t be happier. DI: How has Nick developed in his time as a Duck, and what are his strengths? SG: I’ll tell you, in all my years of coaching I really don’t know if I’ve had a player that prepares himself better for a football game. Nick’s strength is definitely in the way he studies the game, studies the opponent, and is able to make the right decisions on the football field. He’s not the most talented athlete out there. He’s not the biggest, the fastest, the strongest guy, but he knows what’s going on out there, and is able to put himself in a position to be effective. He’s a pretty self-motivated, driven guy. DI: How do you know he has done all this preparation? SG: I know by the way he comprehends and understands in our meetings and on the practice field and that carries through at game time too. There are some guys, you can put up a picture on a projection screen and they can tell you what to do, but does that translate when the gun goes off and there’s bodies flying all over? Nick is able to make that transition from classroom to the field, and see all the subtle nuances of the game of defense. Mighty Oregon Reporter Dusty Ritter has been a Duck fan since he was ten years old, and started writing at a local newspaper when he was only fifteen. His favorite Duck football moment was in 2003 vs. Cal when the lights went out at Autzen stadium with Oregon behind, but the Ducks beat Aaron Rodgers and crew in a dramatic comeback fashion. 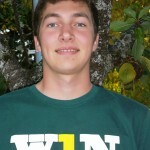 Now, age 21, he attends Oregon games and plans on studying journalism at the U of O. Mighty Oregon is an independent full color magazine dedicated to covering University of Oregon sports. It is available free of charge in the Eugene-Springfield area at the following locations: Dari Marts, Bi Marts, Knechts, Duck Stores and Oregon Sports stores. We publish after every football game and then once per month through June, for a total of 20 issues, and we intend increase our frequency in the near future. A Duck fan can subscribe for $45 (we have to ship first class which costs about $35). To order, email mightyoregonmag@yahoo.com or call Jerry Thompson at 541-221-3154.